Next of Kin: Son of Edwin J and Mrs Dash of Richmond Cottages; husband of Kate Louise Dash; brother of Arthur Dash, 5th Dragoon Guards. “Sgt E W Dash, Worcestershire Regiment … has been awarded the Military Medal. He’s been at the front since March 1915, having joined the Malvern Chum’s Company. On the 5th April 1917 he was one of two NCOs left unwounded during the attack on a quarry, he carried on bravely under heavy fire from the flank and front and was invaluable in reorganising his platoon and consolidation the position gained. He was formerly a patrol leader with the 1st Malvern Troop, and got a reputation as a good boxer. Before enlisting he was employed as an under gardener by Mr Rashleigh of Malvern Wells. 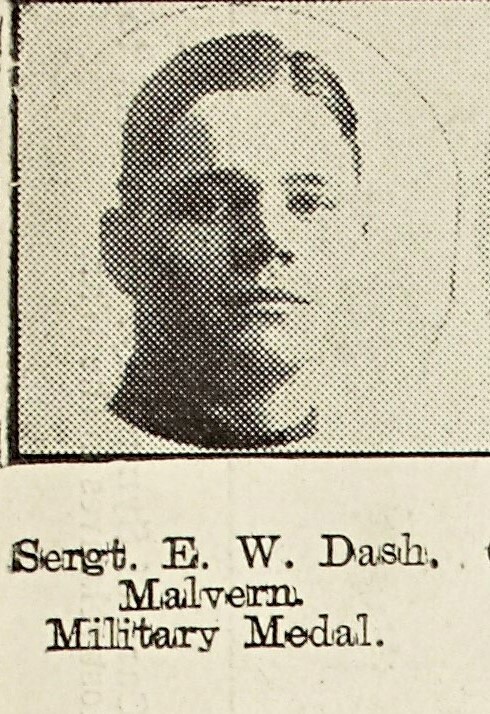 His brother Mr A E J Dash has been at the front since the outbreak of War and is now in the Machine Gun Corps, having transferred from the Dragoon Guards. In November 1917 he was selected for a commission, but for some reason this was not granted. He decided to stay in the army after the war and was serving in the 3rd Worcesters in India, when he was murdered by a native guard.